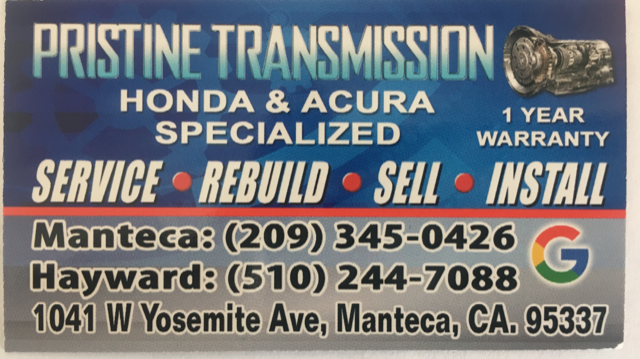 Welcome to Pristine Transmission Honda & Acura Service in Hayward, CA. We provide a range of transmission services at an affordable price and offer a one year warranty on our workmanship. Our transmission repair shop specializes in Honda and Acura vehicles, but we also work on Chevrolet, GMC, Lexus and numerous other makes. We perform transmission delivery for all shops 60 miles around, serving the areas of Manteca, Merced, Sacramento, Stockton, and Tracy. To learn more about our transmission rebuild, repair, and installation services, please contact us at Pristine Transmission Honda & Acura Service, today.